All New and Now Available! The Microsat WX3IN1 Plus 2.0 is a combination APRS iGate, Digipeater and Weather Station gateway device with built-in telemetry and capable 1200 AND 9600 baud AFSK packet! New features in WX3in1 Plus 2.0! Path checking - the decision to frame forwarding is based on a path, the user defines whether to forward WIDE1-1, Widen-N, Spn-N frames and the maximum value of n.
WX3in1 also allows you to generate APRS data frames APRS with information field defined by the user and send them in a specified interval. In this way, it is possible to send beacons and objects. 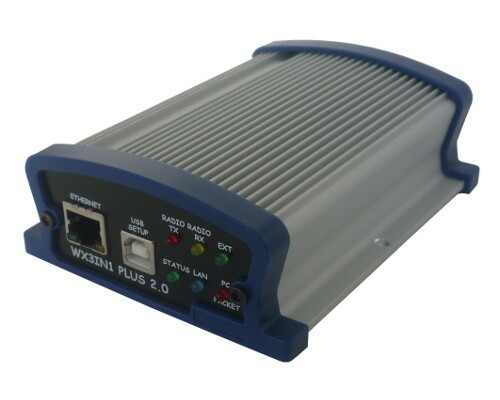 WX3in1 allows you to connect to APRS-IS network servers. After logging onto a selected server, it is possible to send data received from the APRS radio network. All frames with correct format and checksum are sent by the device. The device allows you to receive messages from the APRS-IS server. Then the destination station is checked if it is heard in the immediate vicinity of the radio APRS network. If a station is heard then message frame is sent via APRS radio and repeated three times in the absence of confirmation ACK. WX3in1 allows you to receive weather information from weather stations via the RS-232 cable. The data is then encoded into the APRS frame and may be sent to a radio network at specified intervals. Additionally WX3in1 Plus allows you to send the same frames to APRS-IS server. With firmware version v1.00 and up, it is possible to configure and view device configuration remotely via web browser.